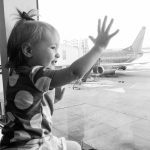 If you’ve been reading my blog for a while, you know we do a lot of air travel with our kids. Just in the last year and a half, we’ve been on six roundtrip flights with our girls. We prefer flying over road trips, and we’ve never let kids get in the way for our love for travel. In fact, we love family trips! It’s quite an ordeal packing for two additional tiny humans, and what we have in the carry on for kids can either make or break a flight. Through trial and error, I’ve found what works best for me to pack in the kids’ carry-on bag. 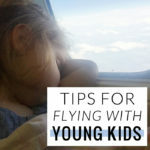 Here are a few of my tips on how to pack a carry on for kids! The right bag can make all the difference. Even though my kids are not babies, I still have one in diapers. I absolutely love diaper bags for travel, and even beyond the diaper stage – simply because they’re just great mom bags. I recently received this gorgeous bag from JJCole and it’s definitely coming with us on our next trip! It fits everything I’ll need to pack for the girls, along with my items. The bag is the epitome of fashion meets function. It has ten pockets and even stroller attachments. Now, that comes in handy while trying to haul all of your stuff (plus children) through the airport! My bag is the JJCole Caprice Bag in Heather Gray. Now that we’ve gotten the most important part out of the way (the bag, duh! ), here are some things that I definitely recommend to pack in your carry on for kids. A pair of headphones for each child // Headphones are a must on a plane. Games and kid shows can get really annoying to those around you. Anything to reduce the chances of you being those people on the airplane. A device for each child // Kennedy got an iPod when she turned five, and it was worth the investment for air travel alone. Caroline gets to play on my iPad, while Greg and I read or watch TV on our phones. Headphone splitter // Sometimes they’ll want to watch the same thing, even if you give them multiple devices. This comes in handy so they can watch a movie together. If you have more than two kids… well, I guess you’re out of luck. Portable charger // In case you need to charge anything! Super handy to have. At least three snacks per kid // At least! I pre-portion everything out in ziploc bags before leaving. Miraculously, your children become snack monsters. Well, they’re always snack monsters… but I digress. The flight attendants are great and will bring more snacks if you request, but try not to rely on it too much. Snacks = sanity. My kids also act like they’ve been dehydrated for years (I guess the plane makes them thirsty? ), so we usually buy a bottle of water once we get past security. Diapers and wipes // Crazily enough, I have actually forgotten diapers in my carry-on bag before. I approached a nice mom in the airport and asked if I could bum one off of her, and thankfully she understood my desperation. I’d recommend going with about four. You just never know. Small toys and loveys // If you’re on a long flight, the kids may get bored of their devices at some point. Having some small toys to play with can buy you some time. Blankets // I love swaddling blankets for travel, and Caroline still loves to sleep with them. They’re perfect for when the plane gets cold. A change of clothes for each kid // Like I said before, you never know. I’ve had to change their clothes a handful of times, and I’ve always been thankful for a change of clothes in the bag. Empty sippy cup // Helpful if you have a toddler who isn’t great with handling drinks. We ask for water or juice on the plane and then just dump it into the sippy cup. That about covers it! I love how everything we need fits perfectly in my new JJCole bag (including my items! ), and is just a great bag overall. Even though I think it’s the perfect travel bag, it’s the perfect everyday bag when I’m out and about with the girls. What is a necessity for your carry on for kids? I love that JJ Cole bag! These are great tips. Super cute diaper bag!! I love your packing list!! !